Over the years I’ve worked on many incredible guitar amplifiers. Each one had its unique strengths and weaknesses. Some were too big, some too small and many were just junk. That really cut down the field of potential candidates for the amp that fit my needs exactly. I needed something that I couldn’t get off the shelf. It had to be hand wired using the best components, it had to be very rugged, relatively low power, have great fidelity and a big sound. Try and find that sitting on the shelf at the music store. In the past, I have found that the low power miracle amps people were selling, always sounded small or thin. They could produce a distorted drive sound, but couldn’t provide a big fat open sound and most of them had a simple tone control. I didn’t want a one-trick pony, since this amp was going to sit in my home recording environment and be used for a variety of instruments and tones. This is how I came to design and build a DIY amp that I call the producer. It’s my intention to share this experience with you and pass along a few things that I learned along the way. This isn’t an advanced project but it uses a lot of ideas that have been developed since the early 20th century. It’s also a lot of fun to work with stuff from a time, long gone. I have no formal training in amp design. I am a hobbyist that’s been doing amp repair and modification for about 20 years. I also have 20 years’ experience servicing industrial electrical equipment and years of related training. My experience allows me to work on this project with a high degree of safety and safety is always the most important consideration when working with electrical devices. This is not an instructional exercise and is provided for entertainment purposes. Should you decide to work on amplifiers with high voltage circuitry please ensure that you are capable of understanding the risks and working safely. This design uses voltages that can cause serious harm or death. As you’ll see, these goals helped to define how the amp would be built. At this point it’s just ideas. 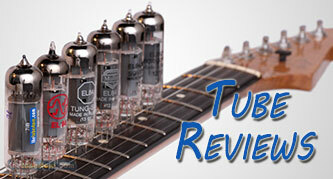 The class A design produces a very rich tone with nice harmonic content. It’s very simple and can be wired up without an elaborate circuit board. The simple circuit reduces the number of components and this in turn increases the fidelity. In my opinion, the more stuff you cram into an amp, the more you will have to deal with noise and colouration of the signal. True point to point is a design practice that goes back to the beginning of tube design. There are no circuit boards. Components are connected directly to other components and use small terminal strips where required. There’s signal path is direct and the build is very rugged. When most people think of point to point, they are thinking of amps from the 50’s and 60’s that used some variation of a board using eyelets or turrets to mount the components. Leads are run from this circuit card to chassis mounted components such as jacks, pots and tube sockets. When you wire an amp using any of these options, you have the ability to quickly substitute parts or make circuit changes. Most modern amps use a printed circuit board (PCB) that is usually fiberglass with bonded copper traces that run between components. If you talk to an amp tech they will tell you that this is where a lot of problems occur in modern amps. If made to high standards these PCB’s can be very reliable, however, repeatedly removing and installing components can cause them to become problematic. Traces can become cracked and component “pads” can come off the PCB. If you keep the Plate voltage under 400 volts DC, you can run almost any popular output tube. Having the ability to runs different output tubes was one of my design goals. In order to achieve this I decided that an octal based output tube would give me the greatest variety. With the voltage below 400 VDC I can go from a 6V6 to a KT88. In order to change tubes on the fly I had to go with a cathode biased design. The EF86 tube is my personal favourite preamp tube. It is also notoriously problematic when it comes to mechanical noise. It’s a pentode not a dual triode and the large plate is what causes the noise issues. The reason I use this problematic bottle is because the tone is amazing and it has great headroom with a ton of gain. 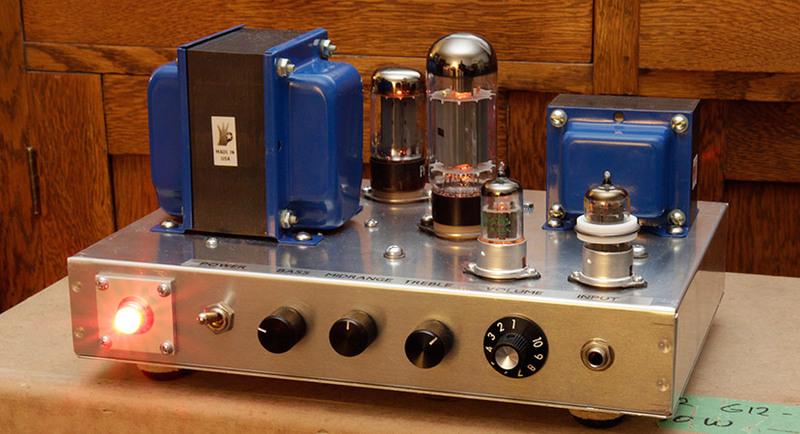 A normal 12AX7 preamp tube has a mu (amplification factor) of 100, while the EF86 has a mu of 300. This gain factor allows you to use the pre-amp to drive a simple tone control, and on to the output tube without any additional make-up gain stage. I find that this tube will pick up incredible detail from your playing and provide a very responsive and touch sensitive front end. The next goal I had to address was to have a full EQ section with Bass, Midrange and Treble controls. This is where compromise #1 has to be made. Even though the Pre-amp is high gain, I didn’t know if it will be enough to drive a full tone stack AND be able to drive the output section into distortion. I wanted to ensure that the amp had just the right gain structure for the desired sound. So I needed a circuit that would drive my tone stack but not add a lot of gain. An insurance policy if you will. The answer was a cathode follower circuit. Two of the most popular amps ever made use a cathode follower circuit to drive their tone stacks. The Fender 5F6-A Bassman and the Marshall JTM45. The VOX top boost circuit is also based on the cathode follower. There’s lots of information about this circuit available on the web, so if you are really interested you should do some research. The reason I chose it was because it’s a circuit that doesn’t load down the signal but doesn’t really add gain. It’s a unity gain circuit that should take my pre-amp signal and safely push it through the tone stack without degrading the tone. My final and ultimate goal was to have a very quiet amp. No hum, no hiss, no mechanical noise. This would turn out to be the single biggest consideration and would affect the entire design. Single ended amps can be noisy by design due to a number of factors. Normally in a push-pull design you have 2 tubes that are out of phase generating noise that cancels itself. This is termed common mode rejection. Another thing to look up if you desire. The EF86 pre-amp is notoriously a victim of mechanical noise and it has a high gain factor. This means that the grounding has to be perfect and lead dress is very important. My cathode follower for the tone stack is also prone to hum because of its design. So I have three strikes against quiet operation. This doesn’t sound like much of a plan at this point but I promise you that all these problems can be overcome with a little thought and a couple of tricks. The values for these components will be dictated by the design. If at all possible I use an aluminum chassis. There are 2 primary reasons for this. The first is that aluminum is very easy to work with. Drilling holes for sockets and components is easy to do and easy on the tools. I also find that it’s an excellent material when it comes to a quiet build. Aluminum is a better conductor than steel and not affected by the large magnetic fields that surround the transformers. The chassis becomes the ground buss. You can find chassis’ readily available online from companies like Hammond, Mouser and Electrosonic. There are many vendors that sell clone chassis for amp builders but I tend to avoid them. They are usually steel, and often stainless steel which has its own problems. Back in the day they would have been carbon steel that was nickel or copper plated and then chromed for looks. Chroming is rapidly becoming a thing of the past so many have gone to stainless and it’s a pain when it comes to drilling, soldering and grounding. In this build, I used a Hammond aluminum chassis measuring 12”x8”x2”. The thickness is .051”. It’s not small but a little extra room allows for changes and unforeseen extras. Transformers are readily available from a number of vendors. Hammond, Mojo, Edcor and Heyboer all make great transformers and of course, you can buy transformers from many of the big amp companies as replacement and upgrade parts. I find that any time a transformer is a direct replacement for a name brand part, it costs more money. If you can spec the transformer directly from a manufacturer you can save. For example, a direct replacement output transformer for a Fender Champ 5F2 may cost $80, while a generic replacement with the same specs may cost you $20. The direct replacement part is designed to fit a certain chassis while delivering predetermined electrical characteristics. We don’t need to pay for that because we’re rolling our own. For this amp I wanted a single ended output transformer that can handle about 10 watts of output, with a good bit in reserve. The power transformer needs to supply high voltage, 5 volt AC power for the rectifier filament and 6 volt AC for the other tube filaments. Since this is going to be a cathode biased design I don’t need a bias winding. One of my go-to transformer makers is Edcor Electronics in the South Western USA. There’s no vintage mojo with cloth braided wire or paper wrapped coils. What you get is above average transformers at a really attractive price point. Here’s a picture of the chassis and transformers I selected for the Producer Amp project. The chassis comes wrapped in white plastic. This is great when you are doing the layout of the components because you get protection from scratches and something to draw on. More on that later. The Edcor GXSE15-8-5K output transformer is rated for 15 watts with a primary impedance of 5k ohms into an 8 ohm secondary. This should be just fine for a good selection of output tubes running with less than 400 vdc on the plates. In addition, the frequency response is 40 Hz to 18 kHz. The extended frequency response will be handy when I want to run instruments other than guitar. The power transformer is another Edcor product, the XPWR-007. It’s rated for 120 or 240 vac on the primary while delivering 200 milliamps (mA) of B+ current at 550 vac. The 550 vac secondary is configured as 275–0–275 volts, center tapped. 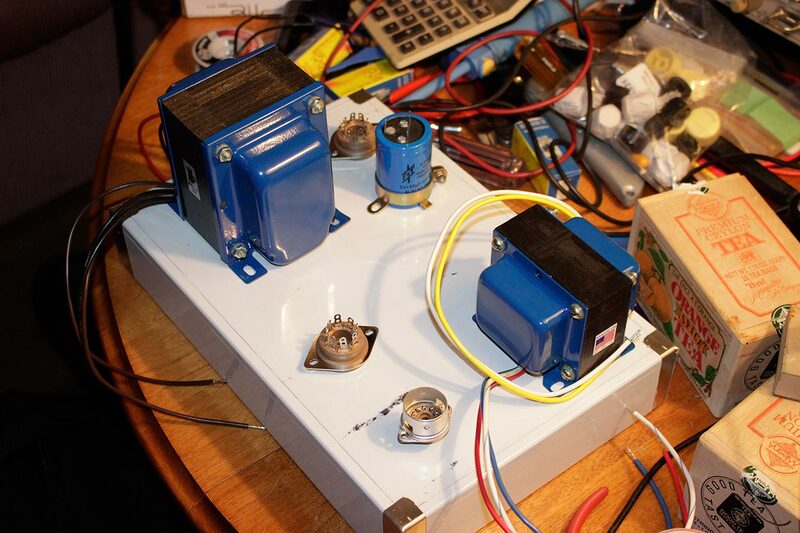 It has a 3 amp, 5vac winding and a 6 amp 6.3 vac winding. This will meet all the requirements of this build with a good reserve of power should I decide to add circuitry down the road. Well that’s it for the introduction. I’ve loosely defined what I want to accomplish in the build, and reinforced those ideas by listing specific design objectives. The fundamental building blocks have been purchased. The chassis, the power transformer and the output transformer. Everything else will flow from those choices. I’m going to follow up this installment with a feature on the actual build process, including an overview of the tools and skills you should have if you want to do this type of project. After that I will conclude the project with an installment on TNT – That’s Testing N’ Tuning the build and determining if the project met the design goals. Update: Part 2 of “If You Can’t Find It, Build It DIY Amp” is now available. Thank you Mr. Templeton, this is one of the best article I’ve read regarding an amp style ( single ended Class A, 10-15 watts, 5F6-A cathode follower) that after playing for 35 years, is my favorite. I’m a woodworker, not an electronics whiz by a long shot, but have by trial and error done a few mods on my amps over the years. Question: Do you ever build any of these to sell? Mr. Templeton is not building these amplifiers at this time. An EF, has anyone done that? As a cowboy amp builder who had a couple of E F 86 s just knocking about i thought i would give it a go and add one to the front end of my home made push pull amp x E C C 83 x E L 84. It was well worth it the input sensitivity goes up a lot and it just sounds a lot better a richer sound. I put it on a bracket inside the amp with vent holes above it. I had no room on top it but they do not seem to get that hot anyway. The E F 86 is a good idea as an add on. 1- there are two diagrams, the one on the 2nd chapter differs from the diagram in the 3rd chapter. which one is the “as-built” version? Can this be used for a turntable preamp?